The latest furor over supposed Israeli war crimes in Gaza has once again followed the classic pattern: a charge made without any evidence later proves to be unverifiable, Israel is put in the untenable position of trying to prove the negative statement, the world media trumpets the charges in bold page 1 headlines, and when the facts are made available, corrections are published in small print well on the inside. The only difference from the alleged Jenin "massacre" is that this time the charges were made by Israelis-- published in English rather than in Hebrew to make it clear that they were playing for the world media rather than attempting to have a serious public discourse within Israel. 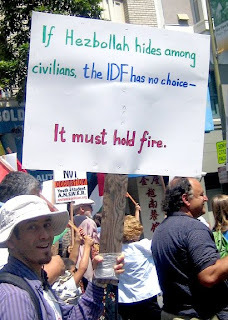 Of course, for the next few years anti-Israel websites and public demonstrations will prominently feature "IDF War Crimes" as part of their many grievances against Israel. But focusing on what did and didn't happen, while important both for the historical record and for Israelis who want to know that their sons behaved morally, really isn't the essence of the issue. After all, in every single war there are soldiers who have indeed behaved immorally; in every single war, civilians are killed either by scared teens armed with weapons, by angry soldiers who just watched their friend get blown into small bits, or by human error when shells didn't get aimed where they were intended. And when fighting against an enemy that doesn't hesitate to use human shields, that cynically uses schools as rocket launching pads and hospitals as military headquarters, that tells its own population that the highest calling they can seek is to become martyrs, civilian casualties are bound to be higher. Hezbollah or Hamas can murder Israeli civilians at will, can rain rockets down over the entire country, and can blow up buses and cafes. But the IDF? It--and only it-- must hold fire. That's the message that is really being delivered to Israel. Double standards, anyone?